I vividly remember how I first learned to take notes. My sixth grade geography teacher lectured in outline style: "Roman Numeral one - China. A - Qin Dynasty. 1 - Rulers . . . " We wrote down precisely what he said, and to this day, I still take notes in outline form. However, consider Sunni Brown's TED Talk, "Doodlers Unite." She argues that engaging in sketching while listening to complex ideas further supports learning. While outlining may work for me, what about those who value taking notes in the margins? How about students who may benefit from audio feedback? What about text-to-speech? Photos? Doodles? When students learn to hand-write their notes, they focus on content and organization within a single medium -- paper. They can write in outline form, create concept maps, or use their own personalized system to support their acquisition of knowledge. But what about the students who struggle to write or prefer to type? For them, paper becomes an inhibitor. 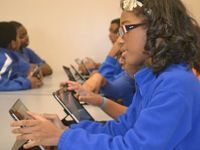 With iPads, the potential exists to leverage these same visual, auditory and kinesthetic processes with multiple media in order to help students make even deeper connections. One of the most valuable features of iPad to support note-taking may be the camera. Students might take pictures of the whiteboard during class discussion and then add them to their personal notes. Others may choose to handwrite during class, take a picture of their paper, and then type additional notes to solidify their understanding. In addition to incorporating photos, many note-taking apps also include audio recording. Imagine the power of supporting a student who struggles with written output by allowing him to quickly record his thoughts, in his own voice, and connect those ideas to the content. The camera and microphone have the potential of empowering students to focus on the task of learning rather than the job of capturing information on paper. We experienced an influx of "laptop kids" in our middle school. These were students with evaluations indicating that a laptop would support note-taking. However, after the first few weeks, these same students often stopped bringing their computers to school. Despite having spell check, a dictionary and legible text, the type-driven structure of a word processing program created a new layer of issues rather than supports. Because the technology eliminated the ability to handwrite and draw, it put my students at a further disadvantage rather than supporting their learning. With iPad, these same students could both type and draw their notes. Whether using Penultimate combined with Evernote, PaperPort Notes (which also includes speech-to-text) or Notability, the potential exists to type and draw simultaneously as well as include photos and audio. Consider the impact on the note-taking process when a student could take a picture of a paper note-taking guide and then type, draw or speak on top if it. Suddenly, students have the opportunity to choose the medium that best fits their learning style. In a recent workshop, one of my participants -- Cynthia McClelland (@CynMcCl), an eighth grade social studies teacher in a 1:1 iPad program -- explained how she addresses note-taking in her class. First, she encourages the students to take notes on paper. Then, she asks them to type a summary of their notes in Evernote and include a picture of their hand-written work. Finally, students add their notes to a shared notebook so that she can review them. However, iPads could also bolster the first step in her process. What if, during the process of reviewing her students' notes in Evernote, she discovers that some of her students consistently miss important points or don't seem to include enough detail? With either AudioNote or SoundNote, she could document their note-taking process in real-time, within the context of the class, and then work to support the development of specific skills. Both of these apps sync audio recording with what is typed or drawn on screen. (You can test this out using the free AudioNote Lite.) Tapping on a word or part of a drawing jumps the audio recording to the relevant position in the track. These apps provide the capability to review exactly what a student writes down while playing back the audio. iPad literally highlights whether or not the salient points were recorded. One of my former colleagues would write all key concepts on the board before the start of her French class. She asked her students to transcribe the notes into their notebooks during the first few minutes of each period so that they could focus on listening and speaking rather than writing once she started the lesson. Across the hall, another colleague asked his history students to come with a three-ring binder. Each day, as they entered the room, he provided a new note-taking guide for them to annotate. Next door, our English teacher leveraged active reading strategies and note-taking directly in a text. When I describe this scenario to other middle school teachers, they regularly nod in agreement as they reflect on their own practices. Much like teachers choose a teaching process that best suits their content area, students need to identify the app, or features of an app, that best supports their learning. Some students might enjoy the freedom of being able to actively listen and then take photos for later reference. Others might furiously type each word, and for some students, paper may be the most effective note-taking tool. The beauty of note-taking with iPad is its impact on all learners.